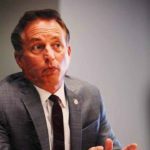 GOP Secretary of State Paul Pate proposed the voter ID requirement now in effect in Iowa, writing it into a law that also shortens Iowa’s early-voting period and places new bureaucratic hurdles in front of voters who have recently moved to the state. Data from Iowa’s June primary election shows hundreds of voters signed affidavits attesting to their identity because they did not meet the new, unnecessary requirements to vote, hinting at the number who may be affected by the law. That opportunity to sign an affidavit in lieu of providing ID will go away after this year.